As closed ecosystems with exceptional challenges, islands are the perfect playground to test circular economics. In 2017, Metabolic worked with the Dutch island of Vlieland to map its resource flows and envision its roadmap towards becoming circular. Although Vlieland faces its own unique circumstances, Metabolic consultant Nadine Galle discovered many of the lessons learned there are typical of the challenges many islands face. As Vlieland continues to further develop its circularity, these actionable insights may not only drive the regional agenda but, in turn, also inspire vulnerable island communities across the world. Vlieland has a lot to be proud of. The island in the North of the Netherlands may be the smallest of the inhabited Dutch Wadden Islands, but continues to attract more and more people every year. In 2016, Vlieland welcome its 200,000th visitor, the most tourists the island had ever seen in one year. That’s the thing about Vlieland, once people visit, they tend to come back. The island boasts the most “sun hours” in the Netherlands, plenty of recreational activities, and the chance to do some serious “uitwaaien”: a Dutch verb so impossible to translate the closest adaptation is, “to walk in the wind and clear your head”. Whether in need of a break or not, Vlieland’s peaceful vibes and large nature reserve make it the perfect getaway for stressed city folk to zen out. Over the years, the line between peak and off-peak tourism seasons has blurred. For most of the island’s 1,085 residents, the increase in tourism has created job opportunities and steady income. Others fear Vlieland’s serene atmosphere and pristine beaches are at risk. One thing is for sure—all Vlielanders are trying to strike a balance between the two—profitability from tourists and protecting the very thing that brought them to the island in the first place. In 2007, Vlieland (and the other Wadden Islands) made sustainability a priority by signing an agreement to be energy self-sufficient by 2020. Since then, the energy transition on the island is well under way, but an integrated sustainability vision for the island is lacking. Energy, but also water and materials (such as consumer goods, food, building supplies) are the lifelines of every islander: so why are they hardly mentioned? Across the island, Vlieland’s residents, visitors, government, and businesses have begun to recognize that to genuinely tackle its environmental challenges it is not enough to make incremental improvements and efficiency gains in the way we produce, distribute, and consume goods. We need to work together towards a systems change: one that will lead to a fundamentally different economic model. One model that could address this is a circular economy, which is “regenerative and waste- free by design.” In a circular economy, materials are indefinitely cycled at high quality, all energy is derived from renewable or otherwise sustainable sources, and natural and human capital are structurally supported rather than degraded through economic activities. Though it may appear that the primary focus of this philosophy is on material recycling and an energy transition, achieving a circular economy requires systemic redesign of our modern economy with a great deal of focus on how it relates to both ecological and human systems. The circular economy describes a new paradigm for urban, and, more broadly, economic development. It forms the basis for the sustainability vision and strategy we have crafted for Vlieland. A living lab can sound a little fluffy, but as the world begins to grasp circular economics, they will also need to grow and protect vulnerable island economies. Vlieland, and the Dutch Wadden Islands altogether, can serve as a valuable testing bed for the ambitions of the Province of Friesland: to become Europe’s leading circular region. Starting on Vlieland makes sense, the economic and environmental benefits of closing loops are more visible, considering the transport costs of resources and waste from the mainland, and the small island scale offers the opportunity for rapid prototyping of innovations. So far, circular economic development has primarily focused on centralised and urban supply chains. Starting small, on an island scale, could bring about the insights needed to further research, experiment, and improve the most promising of circular interventions. Since 2007, the energy transition on Vlieland is well under way, and therefore it is time for Vlieland to move beyond energy and emissions and tackle its next challenge: the transition to a circular economy. Despite its best efforts, Vlieland is lacking an integral vision and strategy for closing resource loops. Pilot projects have struggled to scale up and there has been objection to focusing the island’s sustainability transition on energy alone. Current initiatives also fail to take the inherent challenges Vlieland faces as a touristic hotspot into account, as it struggles with consistent fluctuations in the demand for resources. Transitioning the island economy to a circular state can address these challenges. Currently, virtually all of Vlieland’s products are imported from the mainland. After use, their waste is also transported back to the mainland to be processed. The transport consists primarily of diesel-powered ferries and ships, which carry goods and people back-and-forth from the island. To map out all of these practices, the foundation of the completed report is a Material Flow Analysis, which was used to understand the inner workings of Vlieland from an integrated and systemic perspective. The topics investigated as part of the study primarily focused on the island’s energy, water, and material flows, but also drew upon environmental conditions, socio-economic data, interviews with local stakeholders, policies and strategic plans from the municipal and provincial governments. The Material Flow Analysis of the island revealed important nuances in the water, energy, and waste cycles of Vlieland. For one, water is less of a problem, considering Vlieland is already 100% self-sufficient in its water supply. In 2015, nearly 30 million cubic metres of rainwater fell on Vlieland, of which just 0.7% was pumped up and converted into and used as drinking water. The hospitality and tourism sector uses the largest share of water, guzzling some 41% in 2015. Closely following them are households (25%) and the camping and swimming sector (18%). These, depending on your definition, could also fit under the hospitality and tourism sector considering house rentals to tourist. While there are no problems with a shortage of water, much more power is used to provide the island with drinking water during the peak season in July and August. To save both water and energy, the hospitality and housing sectors could realize significant savings by implementing strategies to reduce consumption. In addition, the island can become a role model for other island communities to share lessons on circular water use. With nearly 200,000 m3 of effluent water being dumped into the Wadden Sea every year, wastewater is an important untapped resource on Vlieland. The value of phosphorus and nitrogen lost to the sea every year is estimated at €176.000. Furthermore, Vlieland’s sewage treatment plant is responsible for all wastewater treatment which produces 1,620 tonnes of sludge. From Vlieland, the sludge travels to Heerenveen to be drained (costs €23.000 every year) and the continues its journey to northern Brabant to be dried and burned. Next steps should examine the possibilities of utilizing these nutrients, instead of discharging them into the sea. The Material Flow Analysis went further than just the energy produced and consumed on the island itself, it also considers the ferry going to-and-from the island. What is most striking is that fuel consumption is responsible for the largest share of energy consumption (43%) of which the ferry represents 38% of the energy consumption on the island. This diesel-driven transport presents a significant challenge for Vlieland: how can we carry this many tourists to—and—from the island in the most efficient, fast and sustainable way? This year, Doeksen Rederij (ferry company) will switch to Liquefied Natural Gas (LNG) which will save on emissions and pollution. In the future, the production chain for bio-LNG or the technology for electric ferries be more technically and economically favourable. Until then, further possibilities for reducing the ferry’s material, waste and water impact can be examined. Back on land, the island hopes to make big steps in the energy consumption of its households and its hotels, which are the second largest energy hogs on the island. Ideally, with support from Urgenda and the Province of Friesland, steps can be taken every year towards the full adoption of the Passive House standard across the island. The Passive House standard could make both new—and old (retrofitted)—houses and buildings at least energy neutral, if not energy positive. However, even if all houses fully adopt the standard, there will still be a demand for energy. This question can be answered by using synergies and by generating renewable energy. The reduced demand, under an energy efficient scenario could be fully met with one large wind turbine. Yet, strict spatial restrictions and protest from the local community (with regards to horizon pollution) are hindering wind energy development on Vlieland. Other options, such as participating in an offshore wind park, compensating with wind energy production elsewhere in the Province of Friesland, or turning to smaller wind turbines with supplementary PV production are explored in the report. Ultimately, though, creating information feedback loops through smart meters and an island-wide dashboard will strengthen, stimulate, and speed up the transition to a circular Vlieland. Although the population is relatively small, tourism on Vlieland is significant, with some 600.000 overnight stays in 2015. This results in a lot of waste, which gives the municipality the second largest amount of waste per inhabitant in the Netherlands (1.360 kg per person per year), after Schiermonnikoog (another Wadden Island), showing the impact of tourism. Of that, glass and paper are separated, but organic wastes (137 tonnes in 2015), plastic, metals and drink cartons are not. All this waste needs to go somewhere. In 2015, 900 tonnes of household waste were transported to the mainland. This required 75 full garbage trucks. The waste travels to a centralized sorting plant in Heerenveen, Friesland, where 35% (consisting of plastics and organic waste) is extracted. The plastic is recycled in small pellets for reuse and the organic wastes are converted to biogas. In addition, construction and renovation on the island led to 1.880 tonnes of building materials needed as input and 600 tons of construction and demolition waste. For several of these waste streams, the key lies in their reduction through smarter procurement, less packaging, and circular construction by encouraging the reuse of demolition materials. A notable challenge here is that to make lasting, meaningful circular change, it is necessary to alter product design and involve the entire supply chain. Though critical, this falls out of Vlieland’s sphere of influence. When waste is collected, it is virtually all mixed together (with the exception of glass and paper) and later separated again, resulting in high economic and ecological transport costs. By identifying ways to close certain material and waste cycles on the island itself by investing in this infrastructure, significant cost reductions could take place in the long-run. Examples of this range from up-and-coming pyrolysis technology for waste, composting of organic wastes, and an online but local marketplace to buy, sell, and share goods. With all of these, experimentation must occur in order to gain economies of scale that make sense, both in terms of environmental impact and financial gains. What’s next for Circular Vlieland? Vlieland has the opportunity to be a unique engine for the broader circular economic transition of the Province of Friesland. 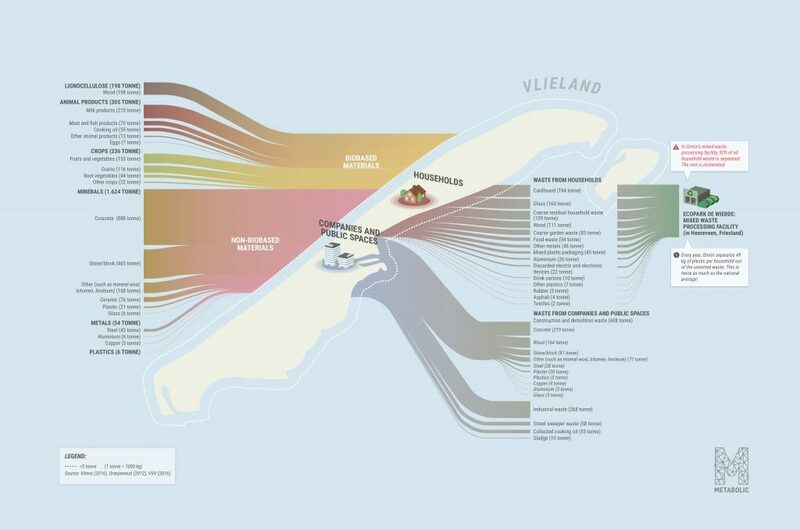 A unique shift like the one proposed for Circular Vlieland requires continuous effort and support from all stakeholders: from residents to research institutes, utilities to developers. Political support and commitment for the ambitions will create a guiding framework for all individuals and organisations active in Vlieland to not only reach its energy self-sufficiency ambition, but also a broader transition to a circular economy. For the time being, various actors on Vlieland persist in driving its position as a leader in sustainability innovation. Lab Vlieland and the annual “Into the Great Wide Open” festival continue to experiment and test new innovations in the hopes of scaling it up across the island—and beyond. The newly launched Kampus Vlieland aims to bring organisations and companies to the island for tailor made sessions on strategy, sustainability and innovation. 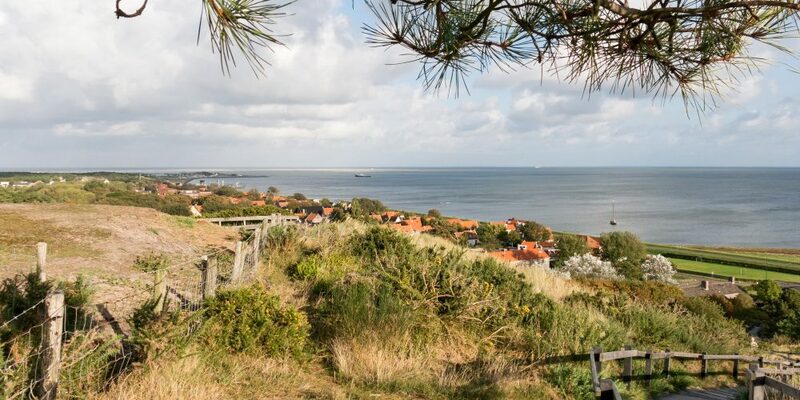 Initiatives like these put Vlieland at the forefront of sustainability transitions while taking advantage of all the beauty the island has to offer. Ultimately, local authorities, industry, and citizens will need to work together closely, and give themselves the space to learn and fail: transitioning to a circular model does not yet have a proven recipe. For more on our work on Circular Islands contact our consultant Nadine.